Living just a few blocks from the Mississippi River, Victor Atkins is used to hearing a lot of strange bird calls at his Laurel Street home. But Monday, one particularly piercing cry caught his attention — and his wife realized it was coming from their backyard. 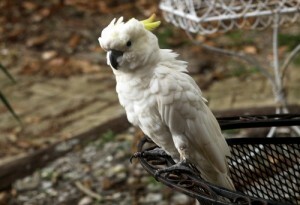 High in a cypress tree above their second-story window, Atkins’ wife spotted a snow-white cockatoo with a bright yellow crest. The bird’s call sounded as though the animal was in distress, Atkins said, and it seemed to be tending to an injured wing. Atkins called out the SPCA, but the bird was too high and they couldn’t coax it down. At their suggestion, Atkins left some chopped up apples and carrots and a bowl of water on a patio table, and Tuesday afternoon, he noticed the bird having its own little tea party. It’s hard to tell if the bird is actually injured, but it is clearly not afraid of humans, watching with interest as Atkins and his children came into the backyard Tuesday afternoon. It certainly seems to be someone’s pet, Atkins said. Though his children had their own ideas for the bird — they had named it “Percy Jackson,” after the protagonist of a current summer blockbuster, by Monday night — the LASPCA picked it up Tuesday afternoon, Atkins said. 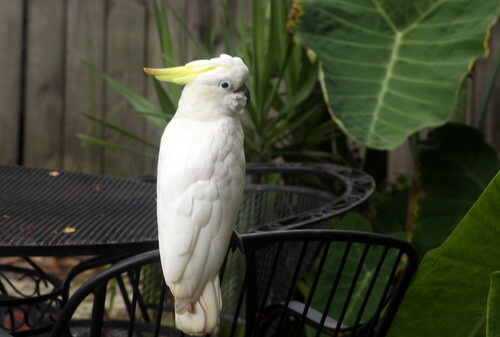 They have a cockatoo that looks like this at Uptown Carwash on Tchop. Maybe theirs got out? I know during the day I’ve seen the cages outside. The bird lives in the 3600 block of Laurel. The owner has been walking the neighborhood looking for it. I let him know it’s at the SPCA. Good work uptownmessenger! YaaaaaaY… for bird and owner !! nice ending.